In field evaluations, we demonstrated that yellow sticky traps baited with the blend of four aggregation pheromone components trapped significantly more cranberry weevil adults than un-baited controls. Development of pheromone-based monitoring lures is an important step toward spatially-precise management techniques that may lead to significant reduction in the use of pesticides targeted against cranberry weevil in blueberries. The cranberry weevil is a key pest of highbush blueberries in New Jersey and of cranberries in Massachusetts. The economic injury is due to the larvae, which feed and develop inside the flower buds and prevent the formation of fruit. Management strategies for this pest are targeted against the mobile adults; thus, monitoring plays an important role in its control. Monitoring for cranberry weevil adults starts at bud swell and continues through bloom; for a total length of about two months. Because weevil populations tend to aggregate at field edges, monitoring efforts focus along these areas. In highbush blueberries, cranberry weevil adults are monitored using beating trays or by visually surveying buds and blossoms (action threshold is an average of 5 weevils per bush or 20% of blossom clusters with reported injury). However, clumped spatial distribution of adults makes the aforementioned monitoring techniques unreliable and expensive. A reliable monitoring tool that estimates cranberry weevil population occurrences and densities is essential for an effective IPM program. Recently, we identified the main components of the cranberry weevil aggregation pheromone and, in field evaluations, we demonstrated that yellow sticky traps baited with the blend of four aggregation pheromone components trapped significantly more cranberry weevil adults than unbaited controls. The goal of our current project (funded by the USDA Pest Management Alternatives Program) is to optimize the lure and trap by testing different trap designs, colors, placements, and blends of the cranberry weevil aggregation pheromone. 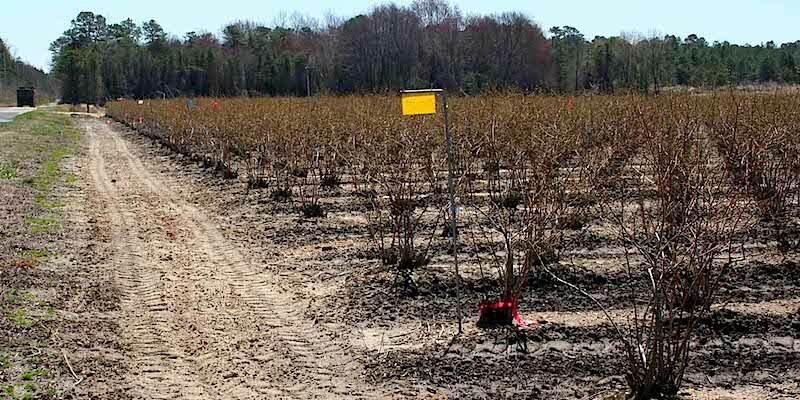 The results will help in developing a pheromone-based lure for monitoring as well as an attractant that can be used in the development of a baited trap-plant control strategy. Development of spatially-precise management techniques may lead to significant reduction in the use of pesticides targeted against cranberry weevil in blueberries.